If you’re in Marietta or the Atlanta metro area and searching for reliable, honest hardwood flooring installation experts, look no further than Mike’s Painting & Flooring. At Mike’s, we can handle all types of hardwood flooring installation jobs. Our experts are trained in everything from sanding and refinishing of existing floors to new hardwood flooring installation and finishing. Whatever the size or scope of the project, our professional crews can help you achieve your home improvement goals. Our crews will take pride in their workmanship, use quality materials, and absolutely will not cut corners when it comes to achieving a superior result you deserve. From the initial call for a free estimate, you’ll find that Mike’s Painting & Flooring is professional, courteous, and focused on customer satisfaction above all else. We will arrange a consultation to assess the work you need done and get you started on your hardwood flooring installation project as soon as possible. Mike’s can also handle commercial hardwood flooring installation. Right now, we’re offering a $250 discount on hardwood or tile flooring installs. With a perfect balance of quality, dependability, and affordability, you’ve finally found a contractor you can trust! Mike’s Painting & Flooring has the experienced, trained, and dependable professionals you can trust to get the job done right. Based in Marietta, Mike’s is independently owned and operated. We’re proud members of the Greater Atlanta Home Builders Association, and are accredited by the Better Business Bureau. Our crews are licensed, bonded and fully insured, and we won’t have any hidden costs when quoting you a price. Once we agree on a price, you can expect our crews to be punctual and to meet our promised deadline for project completion. And don’t forget, we offer painting services, tile flooring, cabinetry, gutter and downspout maintenance, pressure washing, and more! So if you’re in need of quality, hometown hardwood flooring installation expertise, don’t wait any longer. Call Mike’s Painting & Flooring today to schedule a consultation, and get the professional service and results you deserve. If you’re in the Marietta or the Atlanta metro area and searching for reliable, honest home remodeling experts, look no further than Mike’s Painting & Home Improvement. At Mike’s, we can handle all of your Marietta home remodeling needs. No matter the size of the project, our professional crews can help you achieve your home improvement goals. With an artistic yet practical eye, we bring general carpentry and sheetrock repair expertise, and can also assist with installation, replacement and repair of siding, exterior decks, interior railings and interior trim. Our crews will take pride in their workmanship, use quality materials, and absolutely will not cut corners when it comes to achieving a superior result you deserve. From the initial call for a free estimate, you’ll find that Mike’s Painting & Home Improvement is professional, courteous, and focused on customer satisfaction above all else. We will arrange a consultation to assess the work you need done and get you started on your Marietta home remodeling project as soon as possible. Perhaps you have a small siding, deck, or sheet rock repair that you’ve been putting off. Or maybe you want to completely transform your interior with all new railings and trim? No matter the size and scope of your Marietta home remodeling needs, Mike’s can help. With a perfect balance of quality, dependability, and affordability, you’ve finally found a contractor you can trust! Mike’s Painting and Home Improvement has the experienced, trained, and dependable professionals you can trust to get the job done right. Based in Marietta, Mike’s is independently owned and operated. Our crews are licensed, bonded and fully insured, and we won’t have any hidden costs when quoting you a price. Once we agree on a price, you can expect our crews to be punctual and to meet our promised deadline for project completion. And don’t forget, we offer painting services, hardwood and tile flooring, cabinetry, gutter and downspout maintenance, pressure washing, and more! So if you’re in need of quality, hometown Marietta home remodeling professionals, don’t wait any longer. Call Mike’s Painting & Home Improvement today to schedule a consultation, and get the professional service and results you deserve. If you’re in the Atlanta metro area and in need of a reliable, quality painting contractor for your commercial property, Mike’s Painting & Home Improvement is the company to call. Mike’s can handle all of your commercial painting needs. We have experience painting top hotels, offices, condos, apartments, churches, synagogues, warehouses, and more. Our expert painters are trained in all aspects of commercial interior and exterior painting. We can provide a wide variety of finishing techniques and design applications. From initial surface preparation to the final coat, your satisfaction is our number one priority. Our professionals will take pride in their workmanship, use the best quality paints, and absolutely will not cut corners when it comes to achieving a superior result you deserve. -The perfect commercial painting service starts with a smooth surface. We make certain to sand and prep walls, woodwork, and other surfaces properly. -When the final coat is dry and the job is done, that’s all we’ll leave behind. Our Marietta commercial painters take pride in leaving the work site clean after final coat and touch-ups are applied. The commercial painting professionals you can trust in metro Atlanta! Mike’s Painting and Home Improvement has the experienced, trained, and dependable professionals you can trust to get the job done right. Based in Marietta, Mike’s is independently owned and operated. Our crews are licensed, bonded and fully insured, and we won’t have any hidden costs when quoting you a price. Once we agree on a price, you can expect our crews to be punctual and to meet our promised deadline for project completion. So if you’re in need of quality, hometown Marietta commercial painters, don’t wait any longer. Call Mike’s Painting & Home Improvement today to schedule a consultation, and get the professional service and results you deserve. Every homeowner will be concerned about house painting at a certain point of time. This is because the paint is one of the most noticeable features of a house and with that; responsible owners have to take care of it. The thing is that, a lot of owners don’t actually know how to deal with issues regarding house paint. If you fall in that category, you don’t really have to worry much. But since it is so, here is a quick house painting guide that will give you some important details that you have to learn about house painting. When you want your house painted, you can either hire someone to do it for you or you can do it yourself. Both approaches will ultimately get your house painted but if you want the best quality of work as much as possible, it is advised that you hire someone to do it for you. Be aware that if you hire someone to do the job for you, this can cost you up to four times as much as if you do it yourself. If you have the luxury of time and are willing to give the effort, you can do it yourself. This job however is quite hard; this would take a lot of your time and would leave you always tired at the end of the day. The good thing about this is you can save a lot of money, since you won’t have to pay for expensive labor charges of which house painters would charge you for. Yes it is your house and with that, some people would think that they could put whatever color they could in whatever part of the house they want it to be. However, if you do this you might even get disappointed. Choosing colors is one of the toughest parts of house painting, since you have a whole lot to choose from. In choosing colors, you can either mix and match colors or go with colors that follow a certain scheme. If you are doubtful about this, better yet hire the help of an expert. Only start painting if and only if you are already sure of the colors that you choose. You don’t want to paint now and start all over again later if you get disappointed with the results. Yes we know that we have to paint the walls, closets and ceilings but what we don’t pay much attention to is the small details, which are also supposed to have the right colors. These small details include the doorframes, moldings and window frames and if they have the right color, they can boost the overall beauty of your house. In choosing colors for small details, they would have to compliment whatever other colors there are in the room of which they will be placed. It would look odd if the colors do not go together. Small details may really look small but in reality, they are really important. The impact they have on the house is way more that how people think about it so it is very important that you make it look good just as much as the larger details. How can you protect your hardwood floor? Hardwood floors are rather expensive so owners must exercise every effort to protect them. Since they come from exhaustible resources, trees, and take years to produce, they are more tedious to care for and maintain compared to concrete and other types of building materials. Thus, if you’re looking to use hardwood for your flooring, you should be prepared with the right protection methods and tools. First, don’t expose it to too much sun. The ultraviolet rays from sunlight is one of key reasons why some hardwood floors become discolored over time, regardless of its finish or stain. We are referring to the same ultraviolet rays that cause damage to your skin. UV rays do the same to any other type of organic material. To shield it from the sun, install a screen on your windows or use curtains. You can use sheer drapes so it’s not so dark in the room. There are hardwoods that lighten from sun exposure, while materials like oak and cherry will tend to become darker. To slow down the discoloration process, apply water-based urethane finishes to your floor. Oil-based finishes are okay but they have a tendency to turn yellow or amber when exposed to sunlight. Second, make sure it’s always dry. Water is a hardwood floor’s worst enemy. It can seep into the material and cause nasty stains and decay. You can protect your floor by applying thick coats of finishing, but keep in mind that finishes also thin over time so you have to reapply regularly. Wipe up spills immediately and don’t leave wet rags on the floor for a long period. Also, use only dry cloth to wipe your hardwood floor. Never use a damp mop. Another way to protect your hardwood floor is to put felt glides under the legs of heavy furniture so they don’t scratch the surface when moved. Felt glides also cushion the weight of your furniture so they don’t make shallow holes on your floor. The point of protecting your hardwood floor is this: if you want it to last longer than your lifetime, you have to give it the care it needs. And since hardwood floors, when maintained well, can stay on even after a century, they definitely deserve protection. It is easy to build a house using concrete and steel, but it is quite a challenge to do so using wood. You might wonder why this is so, when wood is, perhaps, one of the most common building materials there is around. This is because, unlike concrete, wood is an exhaustible resource. Meaning, if nobody plants trees, then it’s not likely that we will get any hardwood. And since most of our forest are starting to get depleted, then it is likely that the availability and cost of hardwood would continue to rise over time. Thus, our hardwood floors deserve the best treatment, if we are to expect longevity and stability from them. So how do we clean our hardwood floors to ensure that they last long enough for the next generations to enjoy and benefit from? Here are some tips you might want to consider. First, when cleaning your hardwood floor, make sure that you use a broom that explodes at the ends. A broom with too fine bristles won’t trap the dirt and will only have it accumulate within the little cracks and creases. Over time, this will damage your flooring and eventually cause wear. You won’t be able to notice the changes until the damage becomes apparent. Surely this is something you want to avoid. Second, do not use oil based soaps to clean your flooring. 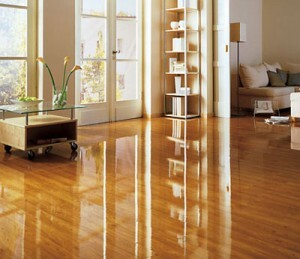 There are cleaning liquids made especially for hardwood floors that won’t cause damage to their finish. Remember that a finish is what shields your hardwood floor from wear and spills, so must always check if the coat is still thick enough to serve its purpose. Third, do not leave standing water or wet rags on your hardwood floor. If this is too late, you can choose to either sand the affected area or replace the plank where the damage has been done. But if the water has just been these for a short while and your finish is newly done, then you have nothing worry about. Just wipe the wet area with a soft dry rag and you’re good to go. Cleaning your hardwood floor requires diligence on your part, because, well, hardwood floors deserve to be maintained properly. They bring stability and sturdiness to your living space. The least you can do is to make sure it is cared for properly. Refinishing your hardwood floors yourself can be pretty daunting and those who are bent on making their floors look like new the do it yourself way may find it more convenient to just have the entire floor replaced, instead. If you are planning to refinish your hardwood floors without calling in the professionals, it is advised that you buy tongue and groove materials so that you can easily snap them together. Buying pre-finished hardwood flooring will also save you a lot of time and effort. What is the cost of re-finising hardwood floors? The normal cost of refinishing hardwood floors around $1.25 to $4.00 for every square foot. If you bring in a professional, you stand to spend between $3 and $3.50 for every square foot on labor alone. So if this is an expense you wish to avoid, then refinishing your hardwood floor yourself is your best option. You do have to be ready for the task ahead, though. The total cost of refinishing your hardwood floor varies depending on several factors. What is your hardwood floor’s present condition? There are instances when, prior to the refinishing job itself, structural repairs have to be made. Such repairs will add to your expense. Your expenditure is also likely to rise further if the floor is covered by another type of flooring, like linoleum or carpet, as having these removed will add to the bill. You can choose to do this job yourself, but you won’t enjoy it. The cost can also be affected by the kind of hardwood you have. Maple, for instance, will need professional tampering because it is relatively difficult to refinish. If you’re working with engineered hardwood floors, this will be easier, but you have to be careful not to accidentally sand through the material. However, while it is costly to refinish a hardwood floor, it is well worth the investment. If maintained well, a floor’s finish can go for 40 years before you need to replace it again. If you’re planning to sell your property anytime soon, having nice and sturdy hardwood floors will help increase its appraised value, so you get your investment back in the long run. Avoid too much sun exposure: If the room where your hardwood floor is has a large window, protect it from the sun using sheer curtains or blinds. Ultra violet rays are said to have ill effects on hardwood floors. Don’t drag your furniture around: This pertains particularly to the large furniture. If you want to move your oak sofa to another location, use a dolly or have people lift it. Never drag it across the floor as it may scar the finish or dig deep into the wood itself. Also, use felt contacts under the furnitures’ legs to prevent their weight from creating scratches and dents on the flooring. Clean up spills and stain immediately: If your hardwood floor has a good and intact finish, then you have nothing to worry about. But if it has already been there for a while, the finishing might already be stripped off and allow the water to seep into the wood. When this happens, sanding and refinishing the part of the floor that got wet is a good idea. If this technique fails, you might have to replace that particular plank with a new one. Sweep your hardwood floor regularly: Use a broom with fine exploded bristles as they are most effective in trapping grit and dust from the creases and corners of your flooring. Broom bristles that are too soft might only drag the dust further into your flooring and fill the cracks.In conclusion, the way you care for your hardwood floor should mirror how you care for things you value. Your hardwood floor not only provides physical beauty to your home but also ushers in a sense of homey comfort that will forever be absent with a concrete floor. While paint of course is necessary to have your house painted all over, you would have to use a lot of different equipment so that you would paint your house faster and much better. That would make some of you think, what equipment do we need? Or isn’t a brush and some paint already enough? Unless you are contented with your house looking like a 5-year old’s crayon sketch then maybe that is all you need. Painting your house is like producing artwork with the house itself as the canvas and with that, you have to put in a lot to make it look like a masterpiece. In order to get you there, you need much more than just a brush and paint. Here are some house painting equipment you can really use. The most basic medium of applying paint to the house is by the means of a brush. While there are numerous options nowadays that would tend to make the brush obsolete since these new options are way faster and more effective, some still prefer the using the brush because it is the best way of painting some parts especially those of which you would have to pay close attention to or some small details such as window and door frames. Aside from the brush, you can use a roller. The roller is much faster and is really effective in spreading paint evenly on where you apply it. If you have the budget, you can go one step further, which is to make use of an airbrush. This is the fastest and most effective way of painting however; it is also the most expensive method. After you have painted your house, it is now time to clean things up. That means that you would of course have to clean a lot of things after you have painted your house. Fortunately, this is very easy to do nowadays with the presence of a lot of new cleaning materials and fluids that are most likely available in housing supplies near you. If paint goes to some parts of which you don’t want it to be, you can remove that using paint thinner. Thinner can also be used to remove paint from the tips of your brushes, this of which you should do right after you are finished painting. If paint gets on to your skin, you can easily remove it with some lotions that are also designed specifically for that purpose. If you use latex paint, water is already enough to remove stains since latex is water based. Only use other fluids if you are using other types of paint. When painting, you would of course have to get to some parts that you could not reach naturally. For you to be able to do so, you can do this through a ladder. Ladders now are more than what they used to be, some would fold to form different forms thus allowing you to move much freely than how the traditional ladder would. For some, they would want to know if they applied just the right amount of paint. They can measure this through an electronic device which would let them know if they did meet what they wanted to. Although this house painting equipment is not really necessary, it is a big advantage especially if you are a commercial house painter.